I'm the type of girl who normally carries everything but the kitchen sink in her handbag and in a bid to downsize my day to day survival kit, my huge bottle of perfume was the first to go. Now perfume atomizers have been around for years, but I was never quite sure where to get good quality ones here in Kuwait. I remember Victoria's Secret stocking a refillable perfume atomizer a year or two ago, however they disappeared from their shelves once I decided to purchase one for myself. Typical. A few months ago, I noticed that feelunique were selling Travalos and I wasted no time in grabbing two for myself. Feelunique has free international shipping and they will reship or reimburse your purchase if a parcel goes missing. I should write a review on them because their customer service is amazing! 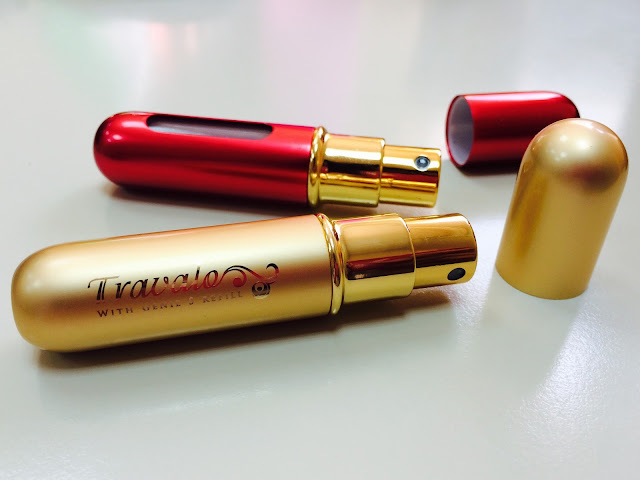 Anyway, back to Travalos..they are seriously the ultimate handbag companion and the easiest way to carry your favourite perfumes around. The atomizers are lightweight, compact (at just 86 mm long they easily fit into the smallest of clutches) and very easy to refill. They come in a variety of different colours so you can use a different colour for each of your perfumes. 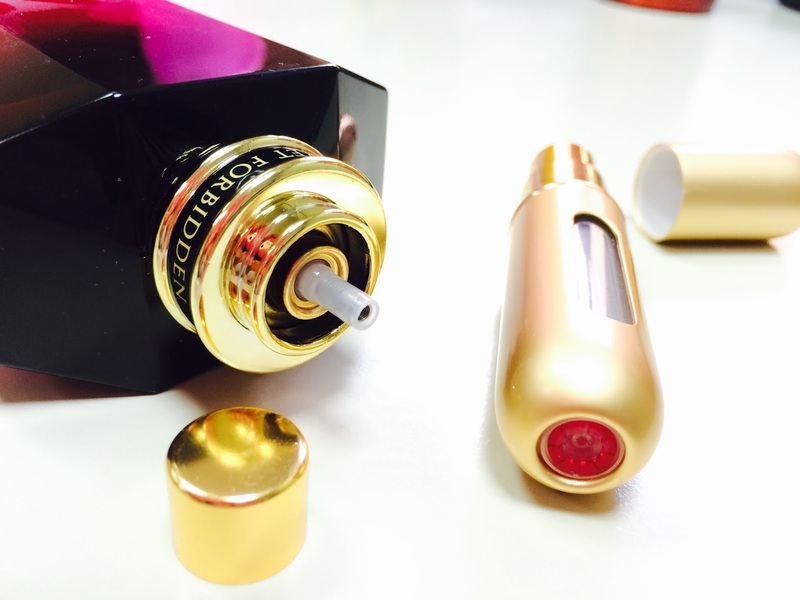 Each atomizer holds 5ml of perfume, which the website claims to be 65 sprays. Now, though I can't verify that fact, despite being a very spray happy person, the perfume does last a long time. They're also aircraft approved and perfect while going on holiday. To fill, you just need to remove the lid of the perfume nozzle, insert the white tube into the base of the atomizer and pump away. There's a clear window on the side that tells you how much perfume is inside. They're selling for just under 5 KD ($16.66 or £11.49) on feelunique. If you sign up with this signup link, you can get 15% off your first purchase, or better yet wait for one of their big sales when the site will have a 20% off coupon code. Overall, this is an awesome buy and I wouldn't mind buying a few more colours. They also make great gifts too! Happy National and Liberation Day Kuwait!